When I think of my favorite things, I try to focus on what has real value to me. And when I put it in that context, the things my father taught me outweigh every other contender. Some of his advice seemed irrelevant at the time, but it would always hold me in good stead when the time was right. If nothing else, I was uniquely prepared for business and life. It may have taken me 50 years to truly recognize and appreciate it, but I am my father’s son. The clues started to appear when I had children of my own. Everyone remembers the first time they sounded like their parents – and it’s usually greeted with half-a-smile and some genuine concern. Your kids will do that to you. Tough love seems to be out of fashion these days, but without it, I’d hate to even think about where I’d be. I was shaped by the tough love of my father, Aunt Ida, Fr. Sturm, Dr. and Mrs. Manzella, and Frank. But, as I look at what has become of me, it is my father who held the chisel. My father never talked much about his dad. There was a time when we were having a particularly contentious moment, and he told me I was just like his father – and it wasn’t meant as a compliment. But as tough as my father was, his mother was the final word growing up. She was a mean-spirited woman, and I always felt she took some of the joy out of his life. Unfortunately for everyone in his life, he couldn’t help but default to some of her disgruntled hostility. 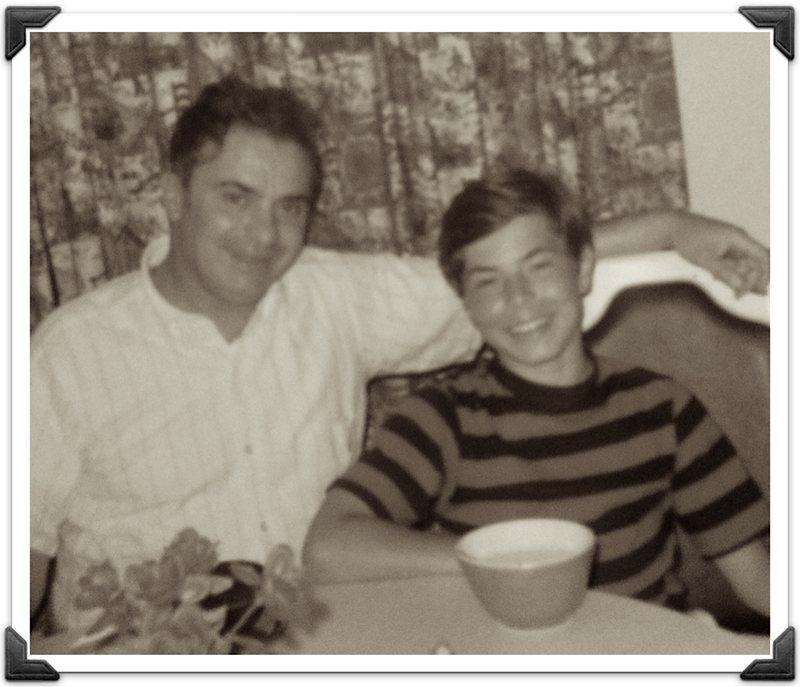 What I remember most about my father is that he was convinced he lived life his way, and in business that was generally the case – but between my mother, his sister, and his mother – his personal life was pushed and pulled disruptively for most of his life. I remember reading about Napoleon’s personal life, and the troubled relationship he had with his harsh mother, wife, and sisters. I felt then that no one escapes the brutal lens of the women closest to you. In the end my father chose a more forgiving and admiring lens, and I imagine that it gave him comfort and solace in his later years [although I wasn’t around much during that time]. Yet, that comfort never conspired to push him to excel the way his mother did. I think when my mother died when I was 9, my father felt it was up to him to provide the harsh criticism that his mother always had at the ready for him. It was not pleasant. “I never trusted anyone with a briefcase.” Now that’s one of my all-time favorites [and probably why I don’t carry a briefcase or have a business card – both of which were anathema to him]. But the one adage I repeat and believe the most “People born round, don’t die square,” may be more his sentiment than statement. “I wouldn’t hire that spoiled brat to run my warehouse.” That one came while I was watching the inauguration of JFK. He went on to explain that he was just a rum-runners bum son, whose father bought him the presidency, and that he should stick to sailing boats. In retrospect, he was dead on, but, at the time, JFK was portrayed as a god to every first grader at St. Benedict’s [whose pastor, Monsignor Tobin was as Irish as the Blarney Stone]. But his disdain gave me a healthy disregard for both politics and fame, and I can never thank him enough for that. And so now I have a life shaped by his values. Independence, virility, and athleticism may be low class values, but they stuck. I still have an antipathy for opera, wine, and elitism. And while it will surely stay with me forever, I now admit that there is, for some, a rare beauty in opera and wine, and an essential comfort for insecure wealth and social status in elitism – but it’s still not for me. To an immigrant’s son, pedigree meant nothing. It wasn’t who you were, where you came from, or who saluted you – it was how you played the game that mattered. And in the end, he played the game quite well.